This paper presents quasi-optimal upper bounds for simplex range searching. The problem is to preprocess a setP ofn points in ℜd so that, given any query simplexq, the points inP ∩q can be counted or reported efficiently. Ifm units of storage are available (n <m <n d ), then we show that it is possible to answer any query inO(n 1+ɛ/m 1/d ) query time afterO(m 1+ɛ) preprocessing. This bound, which holds on a RAM or a pointer machine, is almost tight. We also show how to achieveO(logn) query time at the expense ofO(n d+ɛ) storage for any fixed ɛ > 0. To fine-tune our results in the reporting case we also establish new zone theorems for arrangements and merged arrangements of planes in 3-space, which are of independent interest. 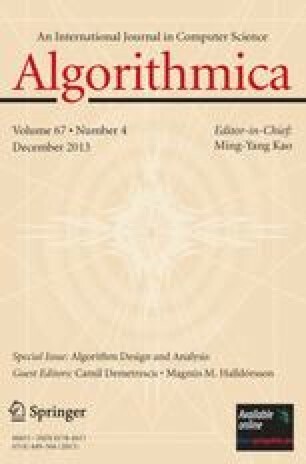 A preliminary version of this paper has appeared in theProceedings of the Sixth Annual ACM Symposium on Computational Geometry, June 1990, pp. 23–33. Work on this paper by Bernard Chazelle has been supported by NSF Grant CCR-87-00917 and NSF Grant CCR-90-02352. Work on this paper by Micha Sharir has been supported by Office of Naval Research Grant N00014-87-K-0129, by National Science Foundation Grants DCR-83-20085 and CCR-8901484, and by grants from the U.S.-Israeli Binational Science Foundation, the NCRD—the Israeli National Council for Research and Development, and the Fund for Basic Research administered by the Israeli Academy of Sciences. Work by Emo Welzl has been supported by Deutsche Forschungsgemeinschaft Grant We 1265/1–2. Micha Sharir and Emo Welzl have also been supported by a grant from the German-Israeli Binational Science Foundation. Last but not least, all authors thank DIMACS, an NSF Science and Technology Center, for additional support under Grant STC-88-09648. Communicated by Mikhail J. Atallah.